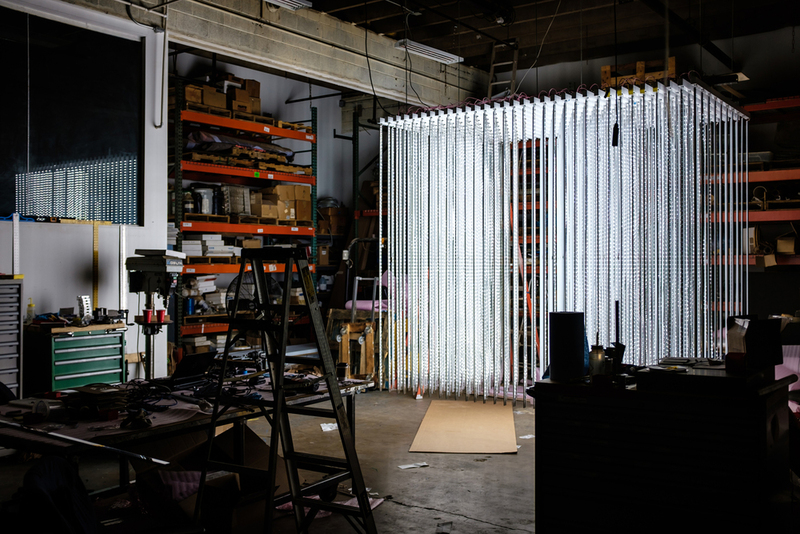 In 2015, Parallel Development fabricated and installed LED artist Leo Villareal's Volume (Renwick) at the Smithsonian's Renwick Gallery. 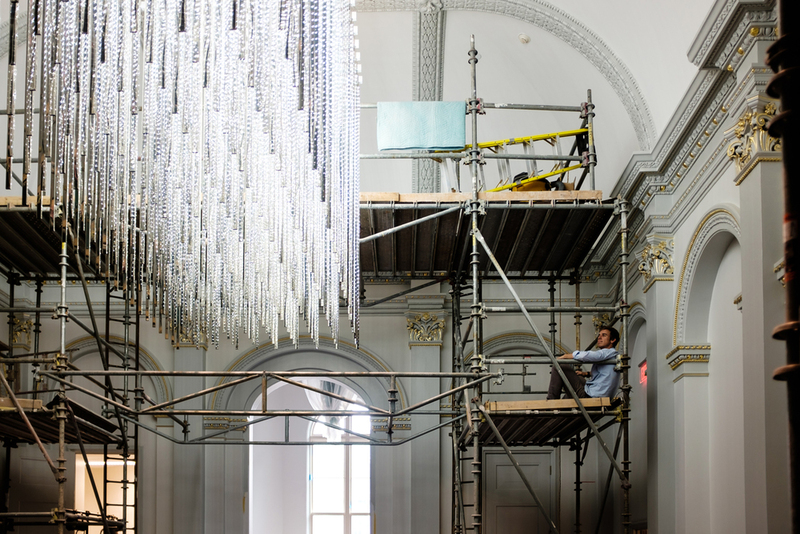 The artwork was created for the museum’s Wonder Exhibition, in which nine contemporary artists were asked to create site-specific installations inspired by the Renwick, open for the first time after a major two-year renovation. 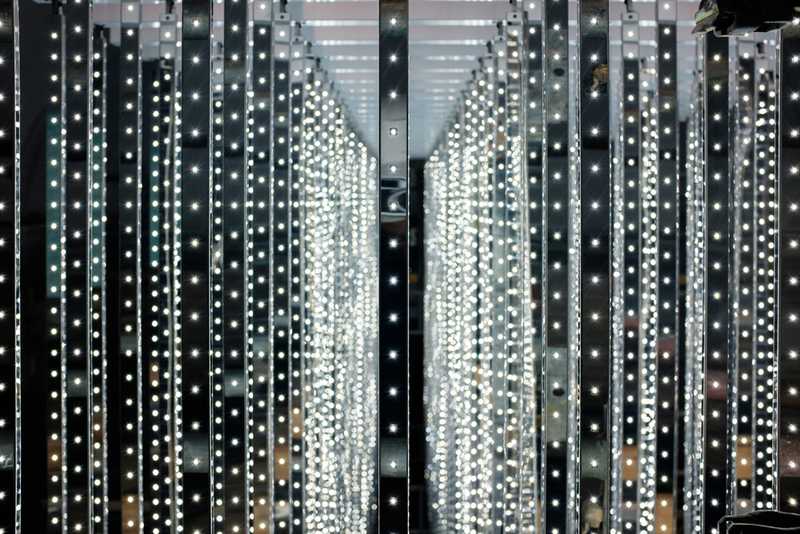 The sculpture features 320 custom, mirrored stainless LED fixtures hanging in an grid over a grand staircase. The challenges presented were numerous. We needed to design a canopy that could support the significant weight of the fixtures and house all the necessary electronics while disappearing above the sculpture. Furthermore, because of the density of the fixtures, they required a hanging method that would allow one person to reach 3-ft into the sculpture and disconnect a fixture one-handed. For the canopy, we settled on a railroad-like structure made of struts and rails that would bolt together for easy shipping and installation. The struts are laser-cut steel evenly spaced down the structure, with structural steel tubing as the rails. The electrical enclosures were then easily mounted to the tubing face and wires routed down into the strut and out to the individual fixtures. Parallel designed the custom LED PCBs along with all the mechanical components. There are no visible fasteners along the 9 foot face of the fixture. To achieve this, the LED boards are adhered to the inside of the mirrored stainless. We designed a pneumatic jig to apply uniform pressure to the adhesive tape as part of an assembly line for the fixtures.